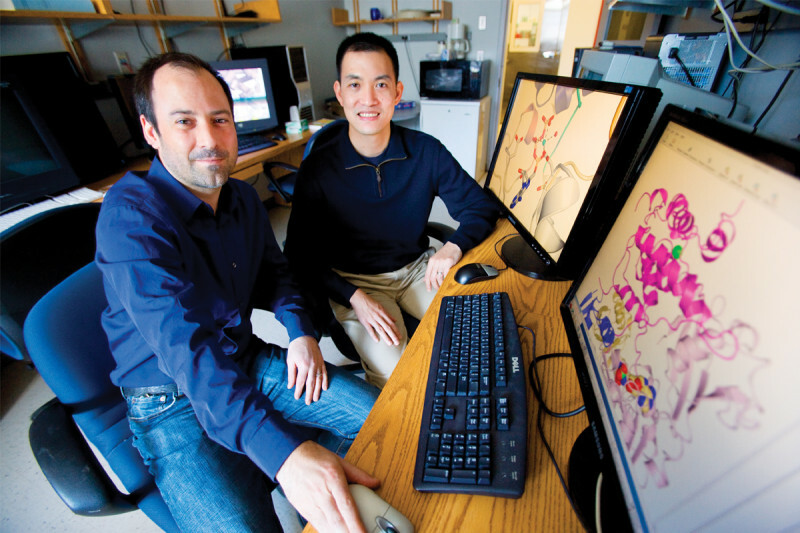 Christopher Lima (left) and Derek Tan revealed the mechanism of a key cellular process. A collaborative team of researchers from Memorial Sloan Kettering has determined the mechanism for a biological process that plays a key role in regulating cellular behavior. A collaborative team of researchers from Memorial Sloan Kettering has determined the mechanism for a biological process that plays a key role in regulating cellular behavior. The process — and the enzymes that control it — has been studied for 30 years, but until now it was a mystery to researchers in the field how this complex reaction takes place. The multidisciplinary team was led by structural biologist Christopher D. Lima and chemist Derek S. Tan, both faculty members of the Sloan Kettering Institute. Dr. Lima’s work has concentrated for many years on the E1 family of enzymes, as well as E2 and E3 enzymes, which also affect ubiquitin, and a related protein known as SUMO-1 (for small ubiquitin-like modifier). Dr. Tan’s laboratory focuses on using chemical synthesis to develop small molecules that are used as tools to study fundamental processes in biology. In two related studies, published earlier this year in Nature and the Journal of the American Chemical Society, the researchers used a combination of chemical synthesis, biochemistry, structural biology, and mutational analysis to arrive at their findings. Inhibitors designed in Dr. Tan’s lab were used to freeze the proteins mid-reaction. Structural work done in Dr. Lima’s lab crystallized these proteins to determine their shapes, as well as to get a clearer picture of how they were interacting with each other. The most unexpected finding was that while activating ubiquitin, the E1 enzyme undergoes a dramatic rearrangement in its shape in order to catalyze the reaction and drive it forward, continually reassembling itself between what is called an open conformation and what is called a closed conformation.This answered the longstanding question of how ubiquitin and similar proteins such as SUMO-1 are able to move between the E1 enzyme’s two active sites. “Enzymes that we know of in the scientific literature right now don’t do this, so there’s no precedent for these types of dynamics,” Dr. Lima said. “In addition to being an important basic science finding, this research also sheds light on the mechanism of a drug that is already looking promising in early clinical trials for lymphoma.” That drug, MLN4924, which is being developed by Millennium: The Takeda Oncology Company, inhibits an E1 enzyme. “Our findings could help with the development of new inhibitor drugs in the future,” Dr. Lima added. “This area of inhibitor design is not something I envisioned working on when I started here eight years ago,” Dr. Tan said. “But as a chemist, being at SKI provides great opportunities to work with biologists. Our collaboration with Chris has been one where we have been able to discuss things on a molecular and structural level, and there’s been terrific communication between the groups.